Thank you Madeleine for listening to yourself, and listening to the universe and trusting that decisions – no matter what they are, are always a step forwards. This journey is one I can’t imagine being on with anyone but you, and the doubts that swirl around when the wound is fresh just won’t hold up to the possibilities that come from the healing. You said to me yesterday that we are ALL leaders, we are ALL creative, and we are ALL just trying every single day to SHOW UP and make an impact for the communities that we care about. Okay – so… we’re going to give one of these communities a few more months to heal from some pretty serious trauma – and THEN we will make our mark on the community of Calgary. Our presenters, sponsors and volunteers have been overwhelmed with disappointment but yet support, and I think it makes our decision easier to digest knowing that it really was right. It was right for the Province, it was right for our distracted Champions and therefore, it’s right for our girls. If I’ve learned anything in 24 hours, it’s that at first, this perceived “failure” seemed so complex, so daunting and so negative – but that really while the logistics of this might be complex, the reality of making the right call was surprisingly simple. I’m not worried about moving this event – or sorting out how we can ALL be better leaders, I worry about the chances we would have missed if we didn’t even try! Today has not only been filled with support and positivity, but new connections, new sprouts coming out of the dirt and the NEW Calgary G Day is already taking shape. Stop letting those gremlins into your internal conversation. We’re all exactly where we’re supposed to be, and we’re right on time. Thanks for sharing. We need to share ALL of our stories and thanks for leading with love. Great post! Events (and entrepreneurship, period) are so very hard and time-consuming. You ladies are doing amazing! These are the moments “behind the scenes” of true greatness. Realising that you have done all that you can, but it is still not enough, you are still a broken earthen vessel. May Somehow … this WABI SABI be fused together with the purest gold. 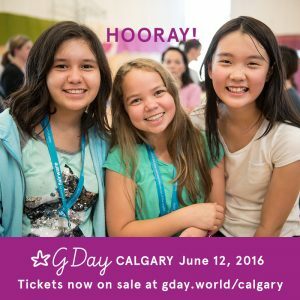 I was wondering what might have gotten in the way of G Day Calgary when I learned of its postponement, and now I know–it was many things, none of which had anything to do with you and your amazing team! You know the need and opportunity exist for G Day, and I know you and your team can deliver an amazing experience (case in point: G Day Vancouver 2015!) This is such an honest and insightful post and your points about leadership really resonate. I’d like to share one more point about leadership–your leadership–and how rare and refreshing such authentic leadership really is. True leadership takes tons of courage and the willingness to have honest conversations; it transcends the person and isn’t about success or failure, so much as about making the toughest decisions, i.e. the best decision possible after considering all the facts, impacts and circumstances. Kudos to you and your team for all of the awareness, interest, partnerships, sponsorships and momentum you’ve generated in Calgary–an amazing city that will welcome you back with open arms in 2017–bigger and better than ever!